Do you need secure storage that doesn't waste valuable garden space or cheapen your decor? 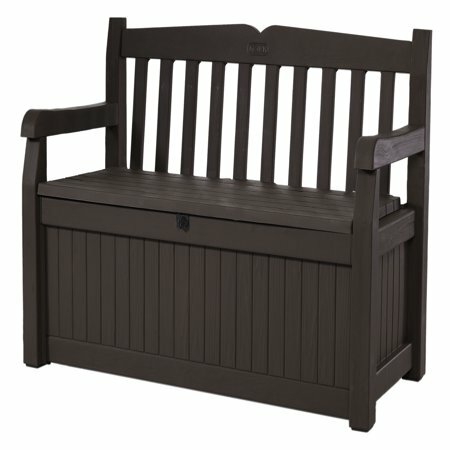 Keter's 70-Gallon Eden Bench Box is both a spacious outdoor storage solution and a practical, beautiful garden bench. 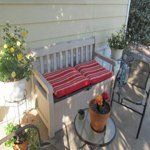 Featuring natural coloring and enough seating room to accommodate two adults, the Eden makes a perfect deck box, romantic garden resting spot or functional, space-saving indoor storage box. 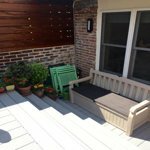 If you have a small yard, you don't want it cluttered with large storage boxes that serve no other purpose. With the Eden, you enjoy 70 gallons of storage capacity plus extra seating for unexpected guests. Whether you're enjoying a little romantic stargazing or reading a favorite book, you can't beat its comfort or stylish good looks. Wood benches rot and metal rusts, but you'll never have to worry about your Eden storage box. 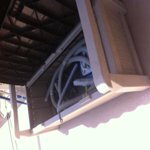 It can withstand the elements for many years with virtually no maintenance. Quick delivery and easy to assemble, less then an hour. Snap and screw assembly (screwdriver only , no power tools required), instruction clear with simple pictures. It is a one person job, well I used two to take it outside. good room inside for my birdseed storage tub and garden tools. Bought cushions from Walmart. Our combine weight is about 300lbs seems sturdy to us when sitting on it and we already used it with friends coming over a few times! Hello desertfolks, Thank you for taking the time to let us know about your experience, we appreciate your comments. It plays a very vital role in our continuous efforts to improve our products. This is my second of these benches. The first one was exactly the same. It lasted for about 8 years and was in an accident. (don't ask). I was determined to find the same one. The first one was a store model, so it was assembled. My husband was busy so I decided to assemble this one myself. It was easy. One Phillips head screwdriver was all the tools needed. The screws and such were separated into little Ziploc bags already, and labeled well. Assembly took about 30 minutes; I have little strength in one hand so the bottom feet (invisible) were a bit tricky. There are 3 long metal bars for key locations that provide the strength. The bars are painted but also completely invisible after assembled. All the instructions and parts were well marked. Why did I want one exactly the same? It is wonderfully stable. It does not seem to absorb the heat of hot Central Florida, so it was always cool to the touch. I loved it's length in that I could sit sideways and prop my legs up or lay sideways and, with a slight tuck of the knees, be comfortable. The storage area is quite nice. It seems pretty waterproof. We stored tools in it and hose (dog eats hoses). The lock device (you supply your lock) sometimes appears to be standing out in pictures, but does not hit the back of your legs. Being a big girl, I appreciated that it would hold me and another person. It has never leaned to any side. It is stable enough to use when standing and leaning on the arm or back. The light weight makes it easy to move for sweeping the patio. The little curve on the back top and the look of the vertical markings on the bottom are pleasant. I may buy another just to have a pair. Yeah, it's plastic, but it doesn't age, and is easy management. Great bench! I hope they keep making them forever. Love this bench, love the color. I was afraid I couldn't put it together by myself ..I HAVE NO patience. My husband works long hours and asked my brother to help, he said he would in a couple days. I was way to excited to get it to wait that long. so I attempted to do it myself.. I DID it.. and it only took about 45 minutes. 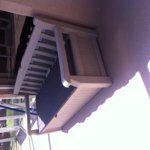 Very sturdy and the storage space is huge!.. only gets water in it when you open the lid... I just open it slowly if there is water standing on the top, not that much got in it when I did it that way. Hello Teclajoe, Thank you for taking the time to let us know about your experience, we appreciate your comments. It plays a very vital role in our continuous efforts to improve our products. To find additional Keter products visit our web sites: https://www.keter.com, http://www.apgparts.com http://uslparts.com. This bench looks great, is inviting for people to sit on, and they do. I have my pool accessories inside and it holds much more than I thought it would. I made a great choice, you made a great product! Just like it looks in the picture. Right size and color. Dry cushions after rainy days. Waiting to use as a bench in summer parties with kids, that's the only reason is missing the fifth star! Hello Pati, Thank you for taking the time to let us know about your experience, we appreciate your comments. It plays a very vital role in our continuous efforts to improve our products. To find additional Keter products visit our web sites: https://www.keter.com, http://www.apgparts.com http://uslparts.com.